This month, the Southeastern Cave Conservancy has taken a huge step forward in our efforts to expand our cave acquisition capacity! As we have reported previously, in early 2013 the SCCi board of directors approved a strategic plan for 2013-2015. 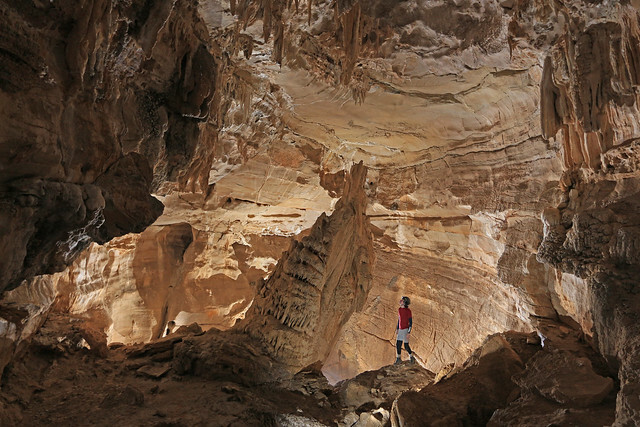 The strategic plan set an ambitious goal – to double and eventually triple the number of caves that SCCi protects each year. In order to achieve that goal, the board recognized that SCCi must ramp up our game with respect to the plans, policies, and procedures that foundations and other major conservation donors expect, and also do a better job serving our growing membership. After much discussion, the board concluded that a key step in our ability to successfully implement the plan was to obtain professional administrative support services for SCCi. At our March 2014 board meeting, we welcomed Sage Morgan to fill this part-time contracted position. We are confident that Sage has the right skills to help SCCi move forward with our strategic plan. Not only is she already assisting with SCCi's day-to-day operations by doing things like dramatically improving our ability to keep current with the recurring credit-card donations from our nearly 500 sustaining members, she is also assisting each of SCCi's volunteer-based committees in completing the many tasks that they are charged with as part of implementing our strategic plan. Hello! I would like to take a moment to express how honored I am to be a part of the growth of this truly grassroots organization. I am inspired by the ability of this "For Cavers, By Cavers" group of volunteers to drive this organization for the past 20+ years. I look forward to helping SCCi move to the next level. My virtual door is always open. Please feel free to call or email at any time. Thank you! Don't forget that the Frick's Cave open house is Saturday, February 15! Several people have asked us what the cave is like. It's a large horizontal stream cave and will be very cold and very wet this time of year. Be sure to wear plenty of warm layers if you go inside the cave and be sure to bring a change of clothes! Others have asked if they can visit the cave another day if they miss the open house. The cave is only open one day a year, so if you want to see it, be sure to join us Saturday! If you would like to go into the cave, you will be required to use gear and clothing that’s been cleaned and disinfected according to the SCCi Cave Visitation Policy. In addition, white-nose syndrome was found inside the cave last winter so please also clean and disinfect your gear after the trip. Right now the weather is looking great for Saturday! Hopefully that won't change! We're planning to cook burgers and hot dogs between noon and 4 PM. We'll also have a fire so everyone can warm up. Please join us around the fire to visit with friends, eat some great food, and meet new friends. The address for the open house parking area is 1536 Fricks Gap Rd., Chickamauga, GA. Directions from the intersection of GA 136 and GA 193 (between LaFayette and Trenton): Go south 2.1 miles to Harold Stephens Road. Turn right. Continue until you dead end into Fricks Gap Road. Turn left. Follow this road to the signs for the open house parking. We hope you can join us for this once-a-year opportunity. We look forward to seeing you! Formation area in Frick's Cave. Photo by JV Van Swearingen IV. Large Room in Frick's Cave. Photo by JV Van Swearingen IV. SCCi to Exhibit at Banff Film Fest in Atlanta Mar. 17 - Discounted Group Tix Available! The event begins at 7 PM; doors open at 6 PM. Films shown during the three hour event (including an intermission with a great raffle!) are among the best films from the annual Banff Mountain Film Festival. As the REI event blurb states: "This year's tour features a collection of the most inspiring and though-provoking action, environmental, and adventure mountain films. Traveling from remote landscapes and cultures to up close and personal with adrenaline-packed action sports, the 2013/2014 World Tour is an exhilarating and provocative exploration of the mountain world." From the film "Down the line"
A few years ago, we had a great "festival before the festival" dinner and social hour at the nearby Gordon Biersch restaurant. If there's sufficient interest, we'll try to do that again - let Dianne know if you're interested, as we'll probably need reservations for a decent sized group. Please contact Dianne Guthrie (her contact info is at the bottom of this note) if you want tickets, and how many. Group tix are all the same price - $12 (vs. regular price of $15 adults, $13 students, seniors and children), and anyone 4 or older needs a ticket. Once she has purchased your tickets, you're on the hook for those tickets! Dianne hopes to be able to hand the out at the DCG meetings in February and March. If you won't be attending these meetings, not to worry - we'll mail them to you! We look forward to seeing you at Banff! I sadly announce that Steve Hudson, longtime friend and avid supporter of the Southeastern Cave Conservancy, unexpectedly passed away while vacationing with his wife Diane Cousineau in Puerto Rico on December 19th, 2013. Steve was SCCi Charter Member #16. He exemplified the backbone of the Conservancy through his Sustaining Membership. He whole heartedly participated in the sustaining program by making a significant monthly contribution every month since the program’s inception more than 16 years ago. Steve’s sustaining membership substantially contributed to the generation of the required monthly operating capital for preserve acquisitions and stewardship. Additionally, Steve graciously gave preserve-specific donations for nearly all SCCi acquisitions. I recall how excited he was when the Conservancy acquired Neversink, Valhalla, and Byers. His most recent preserve specific donation was toward our Run To The Mill Cave Preserve. As an explorer, Steve was the first to dive the borehole’s upstream sump. He pioneered the dive route for those divers that followed. This occurred years before the preserve was acquired in 2013.Steve’s name appears on the preserve map at the dive site for his generous donation to the Run To The Mill Preserve acquisition. Steve endorsed the SCCi’s concept of cave protection and stewardship. He believed in its organization and executing administrators. He confirmed his beliefs through his continued contributions and years of support. Steve made possible the donation of thousands of feet of PMI rope and equipment for all of the raffles held by the Conservancy. The money raised by these raffles provided precious dollars for cave acquisition and preserve stewardship.Throughout the years, he participated as a “matching contributor” on numerous matching donor fund raising challenges. Steve was seen frequently at the SCCi booth during the TAG Fall Cave-In. Sometimes just kidding around with staff or visitors, assisting with our booth setup, consuming an adult beverage, and other times making serious contributions to our latest acquisition or fund raising program. Steve’s support and presence will be greatly missed by the Conservancy and its friends.You can honor his memory and legacy by making a donation to the Conservancy in his name today. DATE CHANGE for the Frick's Cave Open House! DATE CHANGE for the Frick's Cave Open House! We recently learned that the memorial service for Steve Hudson, a friend to many of us, will be held on January 25. We know many of our supporters will want to attend Steve's service so we have rescheduled the Frick's Cave Open House for Saturday, February 15. Please share this information with your friends and your Grotto lists so we can get the word out. December 19, 2013 The Southeastern Cave Conservancy, Inc. (SCCi) is excited to announce the acquisition of the Run To The Mill Cave Preserve! The preserve, which contains at least two known caves, consists of 75.3 acres of land located in central Tennessee, in the southern part of Cumberland County. Run To The Mill Cave contains over two miles of huge “borehole” passages. The underground stream that flows though these passages eventually becomes the Sequatchie River. The acquisition is important on a number of fronts. From a water conservation perspective, Run To The Mill Cave represents the underground headwaters of the Sequatchie River. An underground stream that flows through the cave receives the underground drainage from nearby Grassy Cove. This stream eventually reaches the surface at the Head of the Sequatchie spring in the Devilstep Hollow portion of Cumberland Trail State Park. Much of the land area at the surface of the preserve also drains into the cave through an intermittent stream that flows into the cave entrance following significant rainfall events. Run To The Mill Cave also contains significant biological resources. The cave was recently discovered to host what biologists believe to be among Tennessee’s twelve largest hibernating populations of endangered Indiana bats. Possible sightings of at least two other threatened or endangered animal species have been reported in the cave as well. Finally, Run To The Mill Cave is an extremely significant recreational caving resource. The cave, which had been closed to recreational access for over 15 years prior to SCCi’s purchase of the property, contains nearly three miles of passages and extends 445 feet below the entrance.The upper levels of the cave contain several pits that require expert technical rope skills to negotiate, including the 167-foot deep Tilted Well. Below Tilted Well lie over two miles of large stream passages, and also several areas containing remarkable cave formations. Run To The Mill Cave contains areas with remarkable cave formations. Every year, the SCCi hosts an open house at Frick’s Cave in Georgia, a cave that is normally closed to protect endangered bats and salamanders that live in the cave. This year, the Fricks Cave Open House will take place on Saturday, February 15 from 9:00 to 4:30 p.m. eastern time. Because the federally protected endangered gray bats are not currently in the cave in the winter, the SCCi is able to allow members to visit the cave on this single day. Save the date on your calendars and keep an eye on our Frick's Cave open house page. We'll post any updates or announcements there. Each year, SCCi hosts an Member Appreciation Day for current SCCi members and their guests at Fricks Cave in Georgia, a cave that is normally closed to protect endangered bats that live in the cave. The Membership Appreciation Day at Fricks Cave will be February 17th. On this day from 9:00am until 4:00pm Eastern. Some areas of the cave may be cordoned off to protect hibernating bats. Current SSCi members should will be asked to help our volunteers prepare for the event. A confirmation email will contain event information. RSVP will open closer to the date of the event. Anyone wishing to visit the cave must bring their own helmets, headlamps, and all appropriate caving gear, all of which must be clean in accordance with the SCCi Clean Caving Procedures, in order to be allowed into the cave. The purpose of this requirement is to prevent the unintentional introduction of foreign bacteria, fungus, and other microscopic life forms into the highly sensitive cave environment. Anyone who does not have appropriate gear, or whose gear has not been cleaned as described above, will not be allowed to enter the cave. Because the fungus that causes White Nose Syndrome in bats has been confirmed in Fricks Cave, anyone visiting the cave must also clean and disinfect their gear after the open house and before visiting any other caves. There are no guided caving trips; at least one member of each group should have sufficient caving skills and experience that they can navigate their group through the complex passages of this wild cave on their own. Visitors to the cave should dress appropriately: Fricks Cave is a stream cave, and can be very cold and wet in winter, even when it is warm outside! The water flowing through the cave will be cold; visitors should expect to get wet at least up to an adult's knees, and may also get quite muddy; polypropylene or other synthetic underwear as a base layer will help reduce the very real potential for hypothermia. Anyone planning to visit the cave should plan to have in their vehicle a complete set of dry and warm clothes to change into after visiting the cave. There are no indoor facilities at the preserve. There will be a cookout that will begin at 11:30 am Eastern and food will be served until we run out. We encourage you to visit the cave then stick around for burgers and hot dogs and a visit with friends. Fricks Cave. Photo by Alan Cressler. 9:00 AM - 4:00 PM Cave open for visitation, assuming the summer gray bat colony has not yet returned. Note: SCCi Clean Caving Procedures will be strictly enforced! Frick's is a stream cave, please dress accordingly. 11:30 AM - 4:00 PM Hot food will be available until supplies run out. Location: To protect our properties we do not publish their locations online. If you are a member and do not know where the Fricks Cave Preserve is located, please use the contact information below to obtain directions. The 2018 annual meeting of the membership of the Southeastern Cave Conservancy, Inc. (SCCi) will be held Saturday, June 9th. Location will be announced later. The members' meeting will begin at 3:30 p.m. and the cookout at 5:00 p.m. All times are Central. The meeting is open to current SCCi members and their guests. Are you interested in the inner workings of the Southeastern Cave Conservancy? Unless otherwise announced, all of the meetings will be held at 7727 Harrier Hill, Signal Mountain TN 37377 except for the Spring meeting. The open meeting session begins at approximately 1:00 pm EST.